Wall, NJ: Packaging machinery manufacturer Deitz Co., Wall, NJ (www.Deitzco.com), has unveiled an online library of technical data sheets. Offering free access via the company’s Website at Deitzco.com, the new library features operating manuals, schematics, parts lists and other technical knowledge as downloadable pdfs for its Pharmafill(TM) line of packaging machinery. The online library was developed to provide quick access to instructions, illustrations and guidance on fast setup, smooth operation and preventative maintenance for the company’s tamper-evident neck banders, cotton inserters, desiccant inserters, tablet/capsule counters, heat tunnels and other machinery and equipment. Technical information for several legacy systems including the Versacount brand tablet/capsule counters is also included as a convenience. Offering nearly 30 technical data sheets, the online library is one of several informational resources on the company’s Website, which also includes a video gallery with tutorials and demonstrations on machine operation, and a searchable parts library. Deitz designs and manufactures the Pharmafill line of machinery for packaging pharmaceuticals, nutraceuticals, foods, beverages and other products in its Wall, New Jersey headquarters. The machines ship fully tested with a full warranty. 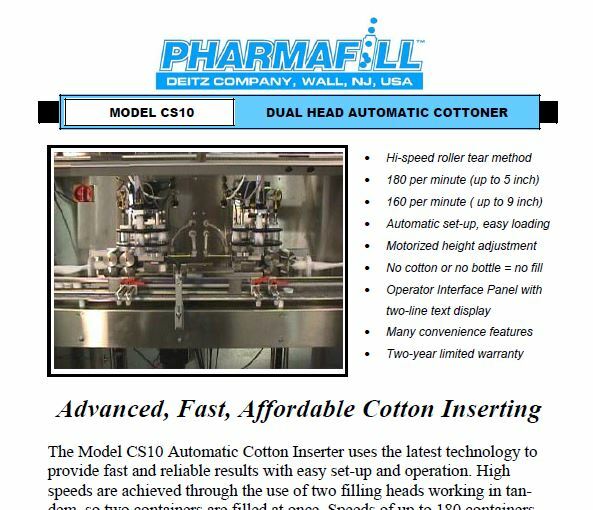 For more information, contact the sales staff, Deitz Co., Inc.; 1750 Route 34, PO Box 1108, Wall, NJ 07719 USA; 732.681.0200; Fax 732.681.8468; www.deitzco.com.